I would agree about applying stain before lay up. I suggest thinning it down heaps with acetone so it soaks deep into the veneer. Use softer wood for the same reason. I thin it right down then do multiple coats to build up the colour. Work it in with a rag and you get the stain going all the way through the veneer. After a few day I then press it with some resin worked into it and some heat so it soaks up resin and comes out flat and tough. You donâ€™t get any surprises out of the press then either. I also sand the back a bit before layup. Use a course grit to really key it in so it bonds really well. Hey does anyone know why my photobucket images donâ€™t seem to show here anymore? Looks like your photobucket account got locked or disabled. So looks like I just caught up with the photobucket rubbish of them killing off free third party sharing. So I've now got imgur and have replaced the images on this thread. Just got to get the sizes right now, they end up bigger from Imgur. So it seems the spoon base of the latest build (the red veneer swallowtail) was definitely not a problem on firm snow. I received a screenshot from the owner of his ski tracker app. He hit a top speed of 94 Kph. Not bad for a little 149cm swallowtail powder board. I've been really keen to make a pair of foldable approach skis for quite a while now. The MTN Approach stuff always looked a bit weak around the hinges and backwards folding so the hinges took all the weight. Turns out I was right, they have a bad rep for falling apart. It's unfortunate because I like the idea. So anyway I have had a few ideas floating around in my head for the last few years and just lately I got into some prep work. A big part is the hinge so I have built a carbon fibre/Kevlar hinge. The Kevlar is impregnated with Shore 95A polyurethane and then I bonded it to some stiff carbon fibre pieces I pre-pressed with the usual epoxy resin. I had a small video of the hinge flexing but I can't work out how to load it. hey Gav, the red board looks great! Regarding approach skis, We rode every approach ski - snowshoe variation we could think of for the decade before splits came out here in Utah in the mid 90s. If you are climbing and breaking trail in good snow they really make little sense. It is just too redundant to have wide approach skis on your feet with a board on the back. Especially since you can make your own sub 6 pound splitboards. I'm not trying to rain on your parade, but I think that you might quickly put a pair of well-engineered approach skis in a dusty corner after comparing a day with them versus a day on a really light split. Maybe the cloth hinge could be a part of a superlight 3 or four piece split like Phenix makes. The exception might be if you have superlight, narrow approach skis and are climbing in firm to shallow snow like the guys in Italy do, they are probably pretty good. But if they are superlight Balsa-Paulownia-carbon deals, will the swing weight be so bad to require folding? Also you really don't need length in those kids of conditions. There are a few touring routes here in Utah with a longer low angle approach that puts you right at the foot of a steep wall where you could argue it is more efficient to get there on superlight skinny xc skis, then leave those at the base and put in a vert track if you repeat the climb three times or more on the vert track. Back when we had altimeter watches we probably had our fastest ascent rates over the whole day from re-using a vert staircase several times. That may have changed since splitboards got into the five pound range, we don't know. But generally we go from place to place and break more trails that aren't all super steep all the way and want the freedom to not go back to the same spot where skis may have been left on the way out. The guy behind Mountain approach had a prototype out there with fabric hinges, but my guess is the market doesn't want it because it's just more weight and expense. You are one of very few people i know who even got around to trying approach skis. The points you raise are definitely things that have slowed down the build a lot, do i just build snow skate type skis for aussie conditions or something that can handle powder. I dont usually hike with my board on my back though. I prefer multi day trips so i can get further out. So my board becomes a pulk sled with my heavy pack on it and i snowshoe to my camp spot. This is my reasoning behind wanting to try something new. Yeah Falls thats the old fashioned way of doing it mate. Its similar to my set up, but i dont have to take a sled with me everywhere i go, i already have a snowboard that works perfect as a sled. 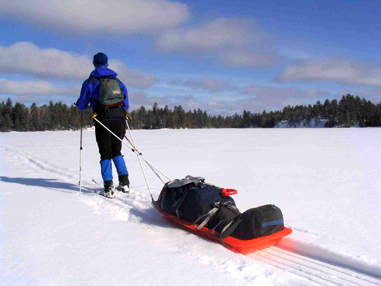 I dont really like the pole connections when using snowshoes as you feel the sled pull and jolt with each step. I have a bit of a bungy type section to smooth out the bumps. I think skinning along on skis will help smoothen it even further. Even straight up steepish terrain with snowshoes is quite comfortable with the sled. Much more comfy than 25 kilos on your back. I've also got a matching pair of boards I have had here slowly progressing for ages. I have really dragged my feet on these. 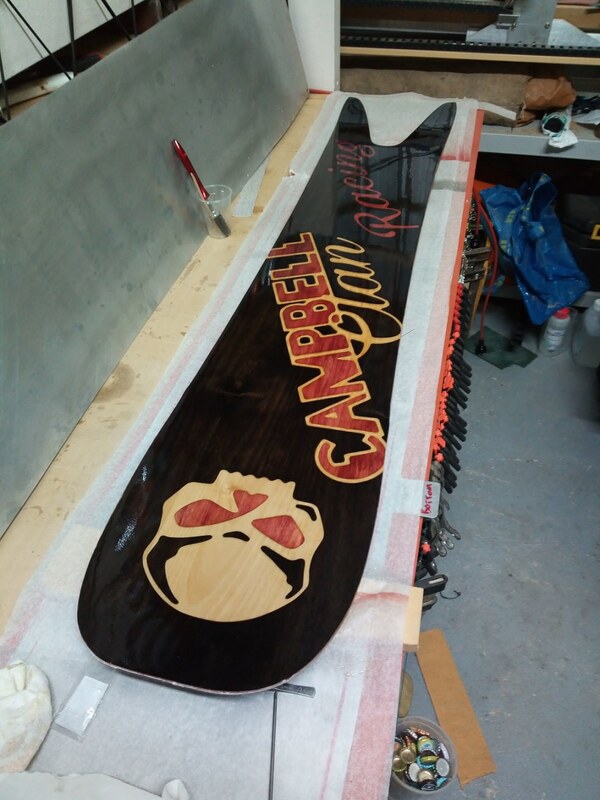 They are a proper freeride type board and a swallowtail with matching base and topsheet designs. They are for a family member who has his own drag racing team. Nothing too full on but he is pretty passionate about it. The problem has been the detail in the topsheet. 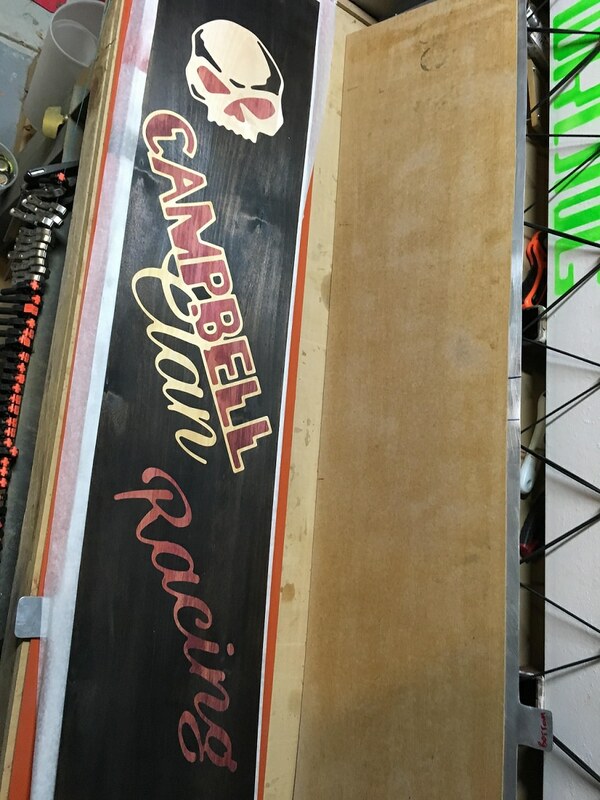 It is three different veneers all cut to jigsaw together into his logo. So I grew a pair lately and got one done. Well almost done. Still need to trim the sidewalls, buff the topsheet and grind/tune the base. This is the topsheet put together before layup. After trim of flashing and a few coats of gloss. It still needs a cut and buff in this photo but I think it is gonna come out pretty nice in the end. The sidewalls are a deep blood red so that should really make the red veneer pop out a heap. It's a 157cm board with a lot of surface area but still some really well behaved groomer style to it. I love this shape. People always think a swallow tail is really restrictive but I have quite a few that are just so much fun banging around bashing up resort stuff. Obviously not the first choice on ice that hasn't seen fresh in a month, but fresh cord on decent snow is crazy fun on a good swallowtail, you can have heaps of camber and still get awesome float in powder.